Al-Qaeda in the Arabian Peninsula (AQAP) has reportedly announced that one of its senior officials was killed in a US airstrike along with his eldest son and other fighters. 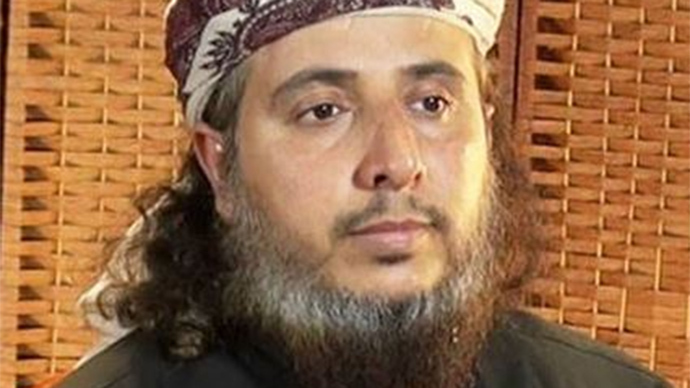 Nasser bin Ali al-Ansi was killed in a US airstrike, the SITE jihadist monitoring group cited an Al-Qaeda video. The report suggests he died on the night of April 21-22 in the port city of Al Mukalla in the south of Yemen. According to witnesses, an apparent drone strike destroyed a vehicle parked near the presidential palace there, killing six Al-Qaeda militants inside. The information cannot be independently verified so far. Ansi was the AQAP commander in northern Yemen, US sources familiar with the incident were quoted by Reuters as saying. No civilians were reportedly killed during the operation. The hit on senior militants in Yemen indicates that the US drone program is still ongoing there, even though American military advisors have been evacuated from the country due to the internal conflict and advances by Houthi forces. Ansi was known for his video statement claiming responsibility for January’s Charlie Hebdo shooting in Paris, where 12 people were killed in the office of the satirical newspaper which had printed caricatures of the Prophet Muhammad. He also appeared in the video claiming the capture and death of US hostage Luke Somers. Ansi is believed to have fought in Bosnia in the 1990s and was an active member of Al-Qaeda in the Philippines and Afghanistan. AQAP was formed in 2009 when Saudi and Yemen branches of the Al-Qaeda terror group merged. It is one of the most active subsidiaries of Al-Qaeda, and is considered the most dangerous by Washington because of its focus on attacks in other countries.